Our family was thrilled to join the Grapeville Baptist church family on Christmas Eve, 2014. Growing up as a pastor's kid in Saratoga, NY, I have long had a desire to serve the Lord as a pastor here in upstate New York. Although we were married in 2001, God did not open the door for me to attend Bible college in Louisville, KY, until 2004. During this time, God reaffirmed my call to the Northeast, and brought us back to this area, where we began working as Youth Directors in a small church in Rensselaer County. 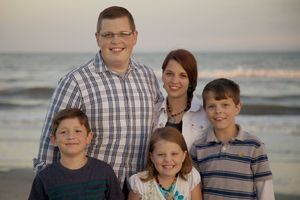 A few years later, God opened the door for us to move into full-time ministry as the Youth Director of a church in suburban Pennsylvania. After spending some time there, the Lord opened the door once again, and led us from suburban youth ministry to senior pastor at church that is over 200 years old. We are excited to be a part of this ministry, and would love for the opportunity to serve you.